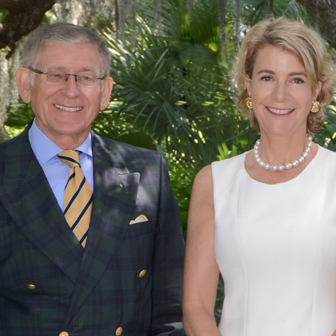 Combining international business acumen with deep local roots, the Johnson-Lang team is a formidable duo whose accomplishments in Southwest Florida real estate are as noteworthy as they are significant. Seasoned professionals with 15+ years of experience, both Nora Johnson and Klaus Lang are consistently named among the top producers at Michael Saunders & Company, representing the most extraordinary and uniqu... more.e properties in the entire region. Nora’s career has been highlighted by many ground-breaking sales, and she continues to push the boundaries by listing the finest and most unique properties in the region. As a third-generation Sarasota resident, her knowledge of the area gives Nora the sophisticated ability to help clients find their perfect lifestyle. Originally from Shaker Heights, OH, Nora later moved to Chicago, where after several years in the Chicago Apparel Center she worked for Donna Karan in marketing and public relations in both New York and Chicago. She has remained vigilant about her community service work, and her involvement includes volunteering at Out of Door Academy - chairing ODA's Extravaganza, serving as trustee at Forty Carrots Family Center, chairing the debut Wine Woman and Shoes event, and serving as chair of four Sarasota Conservation Foundation events, Banyan Balls, the Asolo Theatre’s 50th Anniversary Gala and the YMCA Going for the Gold event. She served on the Marie Selby Botanical Gardens Board of Trustees for the past 10 years, and was also past board chair. Through his earlier career as an international corporate executive, residing in Canada, Europe, Africa and Asia, Klaus has a global perspective of the best places one could choose to live. After experiencing cultures far and wide, he chose to call Sarasota his home. With this enthusiasm for the area, he started his career in real estate. His passion was evident in everything he did. As a result, he has been involved in the sale of some of the most exclusive homes in the Sarasota/Manatee region. He represented the buyers in the largest real estate transaction in Sarasota, the purchase of a Lido Key home and adjacent vacant property for a combined price of $16.5 million. In 2015, Klaus sold the highest priced property Michael Saunders & Company has ever represented, Little Bokeelia Island, offered at $29.5 million. While real estate is his passion, he takes advantage of the opportunities he came here for - and he still loves to travel globally. As a longtime member of Rotary International, Klaus served this global charity organization with hands-on experience in all the countries he’s lived in. He still attends Rotary meetings wherever he travels, maintaining his international connections. Individually, Nora and Klaus stand out as exceptional agents. Together, they set a new standard for integrity, dedication, and professionalism, working tirelessly to provide a seamless customer experience from start to finish. Check out their closed transactions below for reference. ...less.